True cattails belong to the genus Typha. They grow in aquatic environments, especially at the edges of lakes or rivers and in wetlands. The flower spikes have two different appearances. At first, they resemble tan, velvety hot dog buns growing around the plant's reedy stems. At a later stage, they take on a cottony appearance as the mature seeds detach and begin to float away. A number of plants have flowers that resemble either the velvety or the cottony stages of cattail. 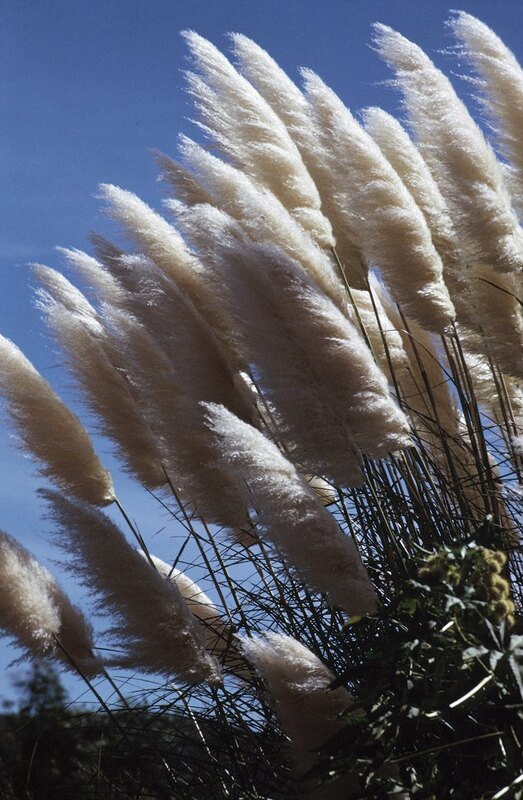 Flower spikes of pampas grass resemble mature, cottony cattail flowers. Some types of ornamental grass bear flower spikes that resemble the cottony stage of cattails. One such plant is pampas grass (genus Cortadera). Native to South America and New Zealand, this group of plants grows in grassy clumps. The white, feathery flowers develop on stalks that tower above the main grassy tussock. In the United States, pampas grass easily becomes invasive, edging out native plants and transforming natural areas into grasslands. Sweet flag (genus Acorus) resembles cattails in two ways. Both plants grow in aquatic conditions, and they both bear tan, rod-shaped flower spikes on the ends of long stems. With sweet flag, however, the flower spikes are scaly rather than velvety, with a cone-like character. The most common species of sweet flag is Acorus calamus. Japanese sweet flag (Acorus gramineus) is slightly smaller and comes in a number of varieties and colors. Nobody is likely to confuse prince's feather (Amaranthus hypochondriacus) with a cattail plant. For one thing, prince's feather blooms in bright red. Additionally, this plant, a type of amaranth, grows like a bush with non-grasslike leaves. The flower clusters of prince's feather, however, have several characteristics in common with cattails. They have a long, tube-like shape and grow aloft at the end of long stems. Like cattails, they are also soft and furry. A slightly smaller variety, known as pygmy torch, blooms in purple. Chenille plant (Acalypha hispida) is like cattail with a fuzzy flower spike that resembles an animal's tail. In fact, chenille plant is known in some areas as "red-hot cat's tail." This common name refers to the flower's bright coloration, which varies from bright red to deep maroon although some varieties have white flowers. Chenille plant grows native in tropical regions, including Melanesia and Malaysia. Unlike cattail, the flower spikes of chenille plant hang rather than stand erect, and the plant itself is bushy.